HomeDesignGive a trendy look and feel to your home office with your vivid creativity and imagination! If you are running a business from your home and planning to expand further, simply start with a new office space. And, when you have landed on this page, I assume that you do not want to invest in purchasing or renting a new furnished office space. 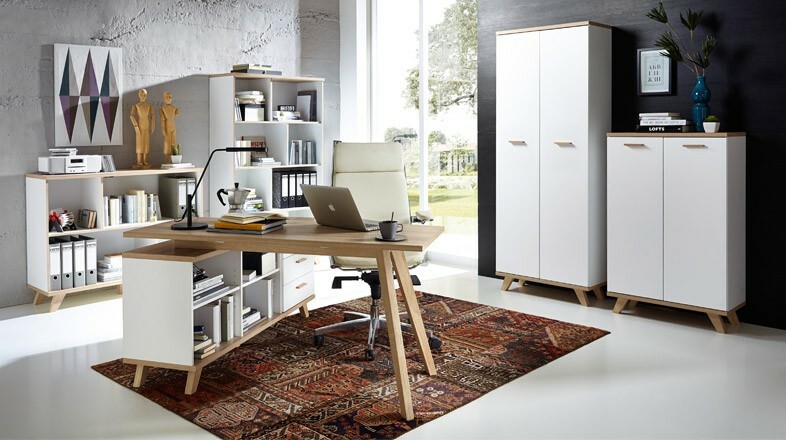 The home office concept has become the most popular trend of this year. Many of us find it difficult to invest in office space during the initial business years. But when you can enjoy the same benefit at home, then what is the need for making extra expenses? The most exciting aspect of running a business from the comfort of your home office is the opportunity to customize your own workspace. The decor of your home office should always reflect your schedule business model as well as your personality. Take time and decide these essential elements properly to offset the stress that comes with business operations. Just focus on creating a welcoming and functional home office space. Of course, it will take more than just the regular work materials. But it’s completely worth investing. The decor elements can help you in creating such an atmosphere that will automatically encourage you to conquer your goals and face the world. Let’s discuss the home office trends of 2018. If you have already spent a part of your entire career life bathed in the fluorescent lighting, I am pretty sure that this trend is just for you. Recently, it has been found that interior designers are putting a lot of ideas and concepts into lighting solutions. Certain types of lights are now available in the market and they can altogether have a different effect on the productivity and atmosphere. But as we all know the natural light is just irreplaceable in a workspace. Ambient and diffused light can just make your workspace engaging and comfortable. Keep your light in the indirect direction so that it does not cast annoying shadows. Various kinds of pictures and lamps are available in the market that will gel well with the interior design of your workspace. You can hire an interior designer to plan lighting, fixtures, and effects properly. You will find that most of the entrepreneurs find it really inspiring to add the pop of colors to contrast against the white office walls. White Walls help to reflect the light and make the available space feel larger, why the color pops is are known for being the way to add mood-boosting elements and personality to the room. You can choose any color that appeals you and then paints the shelves wooden chairs and desk drawers to accommodate with the rest of the environment. Do not just limit yourself to the use of colors; beautiful patterns can also be created on the windows funny chair and walls to add amazing texture to the entire workspace. Building a brand name is known for being one of the most essential aspects of business ownership. And there are many entrepreneurs who prefer to remember this fact and incorporate their personal brand into the home office decor. If you need to conduct business meetings, this trend can actually help you out in conveying your seriousness as a business entrepreneur. It just speaks to cohesion and foresight with your business direction. And believe me; this will seriously impress your potential investors and clients. You can make use of some cool home office gadgets to make your workspace better and “smarter”. You will find that most of the entrepreneurs prefer to put up their favorite quotes or a different form of motivation displayed and framed in their offices. Letterboard is also a preferable choice where you can keep on changing the write-ups to keep others motivated. Vision boards just simply help to take the motivation to the next level by incorporating pictures, quotes as well as goals in the form of a visual setting. These words can easily remind the business owners of their goals, which help in boosting the daily productivity as well as give them the drive and direction for daily tasks. Humans are connected innately with nature. But unfortunately, most of us have to work inside and the connection with nature gets cut off. The bond we share with our Mother Nature is known as biophilia hypothesis. We all know that staying in close to nature has its own set of mental and health benefits. Owing to this factor, it is necessary that you invest in indoor plants like succulents that are commonly featured for their low sunlight requirement and pleasing aesthetic appeal. Ivy plants, as well as low-sunlight leafy greens, are also common plants that are incorporated into the home office decor plans. Incorporating a green wall in the workspace is also a popular trend this year. If your workspace is really small, having walls to separate from the rest of your residential place can actually at to anxiety as well as make you feel claustrophobic. And this becomes more prominent if the flow of natural lighting is limited. I would say that rather than cordoning off the area, it is better that you opt for the railing system for separation. There are multiple railing options available for home office space like contemporary bar system, glass half-walls etc. Moreover, if you come up with any plans in future for updating the reading on your deck or stairs, simply you can make use of the same railing design for adding cohesion to the overall home decoration. When you are designing your workspace at home, then your personality plays a very important role. The choices you make and the decisions you take will reflect your personality. We always prefer to work on our own projects to come up with something that actually reflects our goals and passion. You can consult Best Home Interior Designer in Delhi, Gurgaon, Noida, Ghaziabad. Always remember, your home office is your Throne from where you will ever see the entire Kingdom.